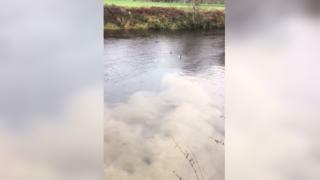 "Absolutely awful" sewage from a storm tank has been pictured leaking into the River Conwy after poor weather over the weekend. Stuart Llewellyn, chairman of the Llanrwst Angling Club in Conwy county, said it happened "every time it rains". Welsh Water said storm overflows were designed to relieve pressure on its system to prevent flooding. Natural Resources Wales said the situation was "not ideal" but added it prevented sewage flooding homes. Mr Llewellyn, from Meliden, Denbighshire, claimed the smell was "absolutely awful" with an official from Natural Resources Wales "retching it was that bad". "Llanrwst the town has expanded but the infrastructure hasn't expanded to deal with the issue," he said. "The system has been filling up more and more. Whenever I go there and it's raining it's doing it. "Two hundred yards away there's a shell beach and children come down in the summer and play there with dogs." A Welsh Water spokesman said it had "permission for this storm overflow from our environmental regulators, Natural Resources Wales". "We are aware of a combined storm overflow into the river Conwy from our wastewater treatment works in Llanrwst. This is due to the recent heavy rain in the area. "As a company so closely linked to the environment, we are very aware of the impact our work has on our surroundings and take our environmental performance very seriously. "In storm conditions, storm overflows such as this are designed to relieve pressure on our systems, to protect our customers and their homes and businesses from sewer flooding. "Usually, this release into rivers or the sea only happens when there's been heavy rain, so any water is diluted and unlikely to cause environmental damage. "Without these storm overflows, sewerage systems would back up, flooding buildings, highways and open spaces." Bob Edwards, from NRW, said: "The law allows this during heavy rain so that sewage does not back up in the system and cause sewage flooding in people's homes. "While this is not ideal, as a result of our visit we can confirm that the impact of this incident on the Afon Conwy was minor."